SAAB 900 1986-89. LUZ INTERIOR NUEVA. REFERENCIA 8547580. LUZ INTERIOR DE TECHO PARA SAAB 900 1986-89, NUEVA. REFERENCIA ORIGINAL 8547580. SAAB 900 CONVERTIBLE AND SEDAN MODELS. Código interno: 296991. Piloto lateral izquierdo SAAB 9-5 SEDÁN 3.0 V6, Año: 1998. Wir können es überprüfen. Nous pouvons le vérifier. Código interno: 296990. Piloto lateral derecho SAAB 9-5 SEDÁN 3.0 V6, Año: 1998. Wir können es überprüfen. Nous pouvons le vérifier. SAAB 900 CLASSIC. A PAIR OF CLEAR INDICATOR LIGHTS FOR. SAAB 900 CLASSIC INC CONVERTIBLE. ALL 900 CLASSIC MODELS HATCH SEDAN CONVERTIBLE. ORANGE INDICATOR LIGHT FOR. 3 DOOR AND 5 DOOR. Posición: delantero izquierdo y derecho. SAAB 9-3 1999 Motor: 2.3 L 2290CC 140Cu. Posición: Delantero. EngineDesignation: B235R. Motor: 2.3 L 2290CC 140Cu. 2005 EngineDesignation: B235E. 2004 EngineDesignation: B235E. Motor: 3.0 L 2961CC 181Cu. FANALE FANALINO FRECCIA ANTERIORE. SAAB 9.3 98>03. DAL 1998 AL 2003. il diritto si applica al prodotto acquistato nella sua interezza;. Conservare SEMPRE 1 bolla con questa dicitura e la firma del corriere. CLEAR REPEATER WING LIGHTS FOR. Anything I discover to be unsuitable I find alternative sources. SAAB 900 CLASSIC INC CONVERTIBLE. ALL 900 CLASSIC MODELS HATCH SEDAN CONVERTIBLE. SAAB 900 CLASSIC. CLEAR INDICATOR LIGHT FOR. ONE SIDE ONLY. FOR CLASSIC SAAB 900 1991 - 1993 WITH LUCAS INJECTION SYSTEM. HALL EFFECT DISTRIBUTOR SENSOR. SAAB 9000 CSE CDE CS CD AERO GRIFFIN. CLEAR INDICATOR LIGHT FOR. LEFT HAND UNITS ALSO AVAILABLE. SAAB 9-3 (9440) Y LENTE DE 9-5 (9600) ALA LADO REPETIDOR (PARTE NO: 12777318). ORANGE REPEATER WING LIGHTS FOR. Anything I discover to be unsuitable I find alternative sources. These indicators make a nice gift or addition to your own car. Saab 900 2 07/93-02/98. Saab 900 2 Cabriolet 12/93-02/98. Saab 900 2 Coupe 12/93-02/98. Saab 9000 Fastback 09/84-12/98. Saab 9-3 (YS3D) 02/98-09/02. SAAB 9000 CSE CDE CS CD AERO GRIFFIN. CLEAR INDICATOR LIGHT FOR. THIS IS THE LEFT HAND UNIT. CLEAR REPEATER WING LIGHT FOR. ALSO SAAB 9000 (ALL) SAAB 9 3 AND SAAB 9 5 (-2003). Anything I discover to be unsuitable I find alternative sources. SAAB 900 CLASSIC INC CONVERTIBLE. Saab 900 2 07/93-02/98. Saab 900 2 Cabriolet 12/93-02/98. Saab 900 2 Coupe 12/93-02/98. Saab 9000 Fastback 09/84-12/98. Saab 9-3 (YS3D) 02/98-09/02. Saab 9-3 Cabriolet (YS3D) 02/98-08/03. SAAB 9-3 (9400) Ámbar / Naranja LENTE DE ALA LADO REPETIDOR (PARTE NO: 9124132). Manufacturer Part Number 9124132. Reference OE/OEM Number 9124132. Nota: esta es la versión de color ámbar/naranja. SAAB 9000 1985 a 1998 años. FANALE FANALINO FRECCIA ANTERIORE. SAAB 9000 CS 93>98 5 PORTE. DAL 1993 AL 1998. il diritto si applica al prodotto acquistato nella sua interezza;. Conservare SEMPRE 1 bolla con questa dicitura e la firma del corriere. FANALE FANALINO FRECCIA ANTERIORE. SAAB 9000 CS 93>98 5 PORTE. ARANCIONE / GIALLO. DAL 1993 AL 1998. il diritto si applica al prodotto acquistato nella sua interezza;. Conservare SEMPRE 1 bolla con questa dicitura e la firma del corriere. 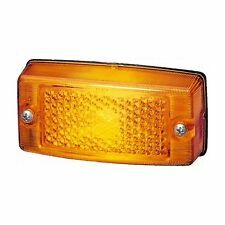 Brand new Yellow / Orange Wing Indicator Lamps (Pair x2) to fit: Saab classic 900 1984 up to 1993 Saab 9000 1985 up to 1998 Saab 900 1994 up to 1998 Saab 9-3 1998 up to 2002 Saab 9-5 1998 up to 2005. Seitenmarkierungslicht ÜRO passend für Saab 9-3 und 9-5. Saab 9-3 1999 Engine: 2.3L 2290CC 140Cu. Part: Side Marker Light Assembly. EngineDesignation: B235R. Engine: 2.3L 2290CC 140Cu. Position: Front. Esto es un bueno utiliza clara señal de la vuelta o lámpara trafficator. Esta voluntad caber todos clásicos Saab 900 y nueva generación Saab 900 coches de 1987 a 1998. FANALE FANALINO FRECCIA ANTERIORE. SAAB 900 93>98. DAL 1993 AL 1998. il diritto si applica al prodotto acquistato nella sua interezza;. Conservare SEMPRE 1 bolla con questa dicitura e la firma del corriere. FRENTE DE SAAB 9-5 (9600) INDICADOR UNIDAD BULBO PORTALÁMPARAS (PARTE NO: 4912564). Other Part Number 4912564. Manufacturer Part Number 4912564. Reference OE/OEM Number 4912564. Colección de Suffolk (IP6) también se pueden arreglar. Einbauposition Vorne. Einbauposition Rechts. Posición de instalación: / derecha (lado del pasajero) delante. CLEAR REPEATER WING LIGHT FOR. Anything I discover to be unsuitable I find alternative sources. ALSO SAAB 9000 (ALL) SAAB 9 3 AND SAAB 9 5 (-2003). SAAB 900 NEW GENERATION 1994 - 1998 INC CONVERTIBLE. SAAB 9-5 (9600) mano izquierda indicador de lámpara (NO parte: 4912515). Other Part Number 4912515. Manufacturer Part Number 4912515. Reference OE/OEM Number 4912515. Colección de Suffolk (IP6) también se pueden arreglar. 501 Side Light Bulbs 12V 5W Capless W2. Manufactured to OEM Specification. Saab 9-3 1999 Amber, Turn Signal Repeater on Front Fender in front Door and behind Wheel, this is the "Side Marker" between the Wheel and the Door. 900 1989 Amber, Turn Signal Repeater on Front Fender in front Door and behind Wheel, this is the "Side Marker" between the Wheel and the Door.